I can hardly believe that it has taken me so long to read this classic of the spy fiction genre. Happily I have now done so. Published in 1974, this wonderfully readable novel of Cold War espionage was written with a backdrop and intimate knowledge of the Cambridge Five and the workings of MI6. A British field agent, Ricki Tarr, has a romantic liaison with a disillusioned Russian counterpart while in Hong Kong. They meet several times over a short period but things go awry when she misses a pre-arranged meeting, and the agreed upon fallback. Like all people in their line of work, they have drop spots and Tarr finds his lover has left an intriguing written account that indicates that ‘the Circus’ has a Moscow-run mole deep within. Tarr takes this to his immediate superior and this brings in the head of the Civil Service responsible for the Intelligence Services and the ex-Deputy Head of the Circus, George Smiley. Once Smiley is tasked with identifying the mole, the narrative switches between flashbacks and past events as told through Smiley’s own memory, current events as he pursues his covert investigations, and back to the past in the documents he reads and the stories extracted from the ex-Circus staff members he interviews. We learn about the main characters, Jim Prideaux, Percy Alleline, Roy Bland, “Control”, Toby Esterhase, Peter Guillam, Bill Haydon and George Smiley through the investigative process. As befits a novel of this nature, the mole “Gerald” is revealed at the very end. However, I’m sure most of us would come to the correct conclusion a short while beforehand or at very least have a strong suspicion that we simply need to have confirmed by the author. This would also apply to the final few actions and outcomes of the novel, but does not take away from the manner of the storytelling which maintains a strong degree of tension for the majority of the book. It is the first novel of the Karla trilogy, involving Smiley’s attempts to follow the trail of his nemesis and Soviet spymaster, Karla. 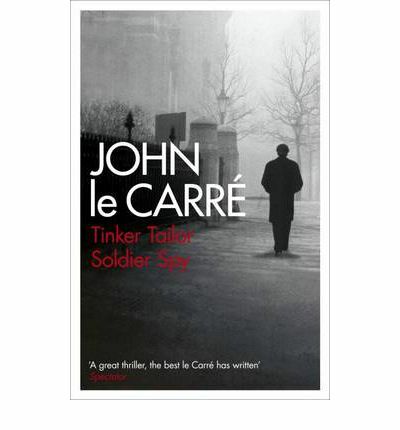 It is the fifth novel of seven to feature George Smiley. The second book in this series is The Honorable Schoolboy, which despite being awarded the James Tait Black Memorial Prize* in 1977 does not make the 1001 Book List, yet the final book in the series does – Smiley’s People. Really. Sometimes it makes you wonder. I enjoyed the small mentions of “Kim” and “The Great Game”, almost as parallels to the Cold War espionage of Smiley’s time. I would have missed the connection had I not already read Kipling’s work and learned from that the long background of Imperial expansion, influence and British vs Soviet/Russian rivalries. I also especially liked the evocative jargon for various aspects of the trade; after all you can’t go wrong with a novel littered with terms like: the Circus, lamplighters, pavement artists, scalp-hunters, baby-sitters, janitors, inquisitors, wranglers, reptile fund, and Persil**. I can happily recommend this for a bit of light, yet highly entertaining reading. It has intrigue, tension, and I think it will keep you in its grip almost to the end. The fact that it is based, loosely or otherwise, on real people and similar events only adds to its charm. The only part of the whole story that perplexed me was Smiley’s dysfunctional relationship with his wife. Perhaps I need to read the prior books to understand that better. Equally good for your summer holidays, or curling up with on a winter’s evening. Enjoy. * this literary prize offers yet more reading options, should you be hard up for choice, as I’m sure you wouldn’t find Siegfried Sassoon’s Memoirs of a Fox-Hunting Man floating around on two many modern reading lists. ** for appropriate explanations of these terms, a quick visit to the Wikipedia entry for Tinker Tailor Soldier Spy will put you straight, just be careful to avoid spoilers – including the section on background which gives away “Gerald”.